What is CenturyLink Remote Services? CenturyLink Remote Services are computer services that CenturyLink provides to its customers via remote control software. Remote Services allow a repair technician sitting in a separate physical location to view and control your computer through the internet. It works like desktop sharing technology and allows support personnel to rapidly resolve computer issues. Do I have pay for this service? There is no cost to you to run the scan (PC Health Check) of your PC to diagnose possible issues. After the scan, a list of recommendations will be provided. There may be services offered for free and some that may be purchased. The PC Health Check scan should take approximately 7 minutes. For the other services, depending on service type, repair can take as little as half an hour or as much as six hours (but can be done while you are away from your computer). Yes. The technology uses 256bit encryption, which is as secure as most banking sites. Only you can initiate a support session and you can always end a session by simply closing the support window. Additionally, remote technicians cannot copy data from your computer. How do I chat with a Remote Services agent? 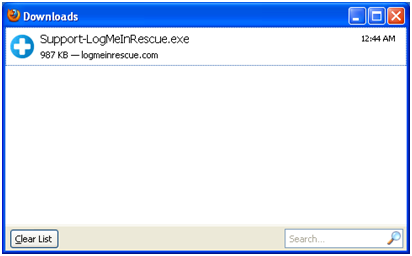 While the service is being performed you can chat with the Remote Services agent at any time by clicking on and opening the chat window labeled LogMeInRescue. Traditional computer support options are typically involved process that are both expensive and time consuming. Options from sitting on hold with a voice representative to taking your computer into a store are not cheap, fast, or convenient. Remote computer support allows a repair technician to access and repair your PC without requiring you to remain in front of your machine. CenturyLink offers the following services listed below. Click on the link to learn more about each service. PC Tune Up is a service offered where an agent will check your PC’s current settings, configure security settings, and optimize your PC. Malware Removal is a service offered when your PC has been diagnosed and found to be infected with malware and/or viruses that can decrease your PC’s performance. Our Remote Services agent will run software tools to remove potentially harmful and corrupted files. This will help to optimize your PC’s performance. Norton™ Online Solutions - This is software that our Remote Service agent can install which will help prevent your PC from downloading malicious files that can harm your computer. Automatic Online Backup – This is a service that our Remote Service agent can perform to help back up and store your important data and files according to your preferences. If you currently subscribe to CenturyLink Personal Digital Vault™, our Remote Services agent can help you set up automatic backups of your files to CenturyLink servers, which you can access later from any PC via the Internet. QuickCare™ Modem Solutions – This is software that our Remote Service agent can install on your PC that will enable technicians in the future to quickly access your PC and troubleshoot any issues on it. PC Health Check - PC Health Check is a free assessment tool which scans your computer and assesses overall PC Health. If issues are found, PC Health Check will offer for pay resolution options. Do the services come with a warranty? All remote services include a one time warranty covering the 5 days following initial purchase. Do I need to watch the entire service? No. You are free to do anything you want during the service. During the service, a Remote Services agent will be performing actions on your PC so please leave the PC on and connected. Everything the Remote Services agent does will be visible to you, so if at any point you are uncomfortable you may revoke service permission by closing the chat window. Once the service is complete, the remote agent will send a message via the chat window alerting you to the service completion. What happens if I get disconnected while a service is being performed? If for some reason your PC gets disconnected while a service is being performed, you can reconnect by clicking on the CenturyLink Reconnect icon on your desktop. Or if you no longer have the icon, connect to http://centurylinkrc.com. 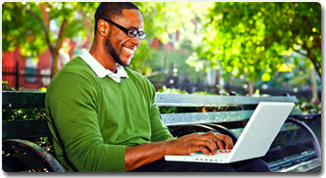 Or if you have lost Internet connectivity you can call CenturyLink Internet Support Group at 1-800-860-2255. Why do you need my Windows Log on info? Your Windows logon information (username and password) is used so that Remote Services agents can reboot your PC without disturbing you. This allows the agent to seamlessly log on to your PC without calling you or waiting to contact you. The Windows log on information you provide to the application is encrypted and will not leave your PC. The information is secured and non-accessible to any of the Remote Services agent. Since you are installing free Antivirus Software, can you install that Antivirus Software on my other PC? Yes. If the customer is current subscriber, the Remote Services agent can install Antivirus Software as part of the Remote Install SKU. Do I need to be present for the scheduled scan of Norton? No. You do not need to be present for the scheduled scan of Norton. As long as your PC is on, the Norton scan will run on its own and provide you with a summary of the results. No. All traces of the software are removed when the service is complete. Your computer will be completely secure after the transaction. What technical skills do I need to use the remote service? The only technical skills required to use the service is the ability to browse to a website. Remote Service agents will assist you through the rest of the process. How will you restore my PC if I do not have a Windows CD or Recovery CD? It is the customer’s responsibility to maintain a copy of Windows. The software and CD is licensed to the customer through Microsoft and without the properly licensed CD, we will not be able to restore Windows. How should I back up my files? You should save all important files and documents by copying your important data to a back up secondary location such as an external hard drive or to the CenturyLink Personal Digital Vault™. It is good practice to routinely back up important data. Why was my PC initially recommended for a Tune Up and in the middle of performing this service, my PC was recommended for Malware Removal? The initial scan performs a preliminary diagnosis of your PC and recommends the minimum service that your PC needs. Upon further inspection, our Remote Services agent might discover additional issues with your PC, especially with malware and viruses that are extremely tricky to diagnose and uncover. As a security precaution, some browsers disable automatic downloads. In most of these cases, a "security bar" may appear at the top of the browser window informing you a download has been blocked. To continue the download, click the security bar and select the option to allow the download. If you do not see the security bar and the download is still being blocked, adding "centurylinkrc.com" (with no www) to your trusted site list often fixes the problem. 1. Go to > Tools > Internet options > Security tab > and select the "Trusted sites" section. 2. Now click the "Sites" button. 3. Type in "download.com" with no "quotes" and no "www". 4. Uncheck the checkbox at the bottom that says, "require server verification..."
5. Click Close > click OK.
6. Click your browser's back button and click on the Download Now link again. 2. Now click the "Exceptions" button. 4. Click Allow > click Close > click OK.
5. Click your browser's back button and click on the Download Now link again. 1) Always save your files! Whenever you download a file, a dialog box should pop-up asking if you would like to RUN or SAVE the file. We recommend always selecting the SAVE option and then choosing your download location. At a later time, you can choose to delete any files you no longer have a need for. Saving your files will also ensure that you have a copy of the file for future reference and may help avoid a lot of unnecessary headaches and frustration. If you decide to select the RUN option instead, your computer will automatically choose a hard-to-find location within it's temporary folders. When finished it will immediately begin to install the software or begin playing in the case of music and videos. If there are any problems when downloading, you will usually have to re-download the entire file again. This is also why we recommend always selecting the SAVE option. The default save location for most computers is the "My Documents" folder. Unless it was intentionally or accidentally changed by the owner of the computer your files should still download there. If you cannot find the "My Documents" folder on your desktop, try going through the START menu and then clicking My Documents. If you do not know your default download location you can try this simple trick to determine where your computer is downloading your files to. a. Start a new file download. It can be the same program you just downloaded or another one all together. b. A dialog box should pop up asking if you would like to Run or Save the file > Choose Save. c. The "Save Window" should now open. The folder name at the top middle of the "Save Window" is your current download location. Please read the appropriate section below for your Internet Browser to proceed with establishing connectivity to our remote support technicians. 1. Download the file during off-peak hours. This is usually in the early mornings or after 9PM nightly. 2. When the file download begins always choose the SAVE option. Then save the file to your Desktop or designated download folder so that it is easy to find later. 1.Internet Explorer has a built-in feature that automatically blocks files from being download. This is a general security protection that will appear below the URL address bar. 4. Select “Save” once again to start downloading the applet. 5. The Download window will appear. Wait until the file has finished transferring. 6. 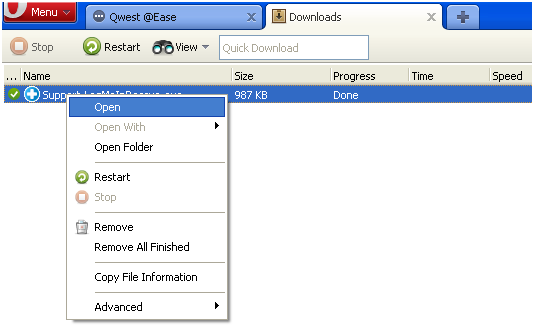 After completing the download, select “Run” to open the applet. 7. Select “Run” to execute the applet. 8. Once the applet is running, wait for the technician to activate your session. Mozilla Firefox handles downloads differently compared to Microsoft Internet Explorer. By default, Mozilla Firefox does not prompt a user to run an application after downloading. 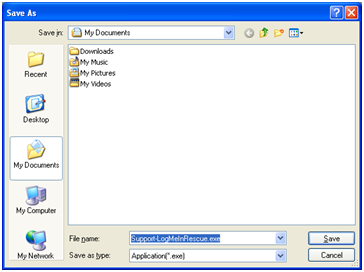 Usually, the user will be prompted to save the file. 1.Select “Save File”. 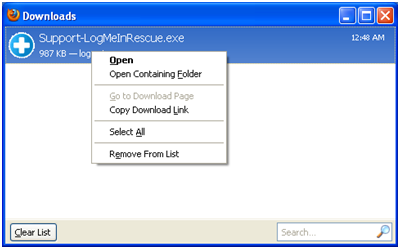 A small applet will be saved as an executable file named “Support-LogMeInRescue.exe”. 2. 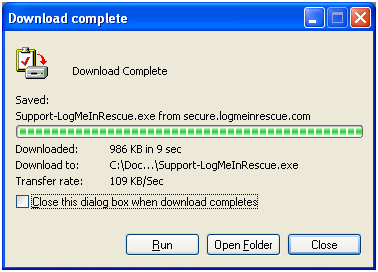 Mozilla Firefox Download window will open and immediately start downloading “Support-LogMeInRescue.exe”. 3. After finishing the download a small pop-up window will appear at the bottom right of the screen. 4. 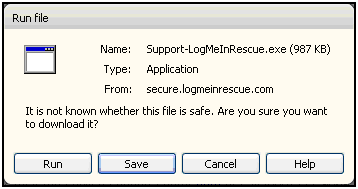 Right-click on “Support-LogMeInRescue.exe” and select “Open”. 5. Select “OK” to open the applet. 6. Select “Run” to execute the applet. 7. Once the applet is running, wait for the technician to activate your session. Google Chrome also handles downloads differently compared to Microsoft Internet Explorer. By default, Google Chrome does not prompt a user to run an application after downloading. Usually, the user will be prompted to save the file. 1.A notification will show at the bottom left part of Google Chrome. Select “Save”. 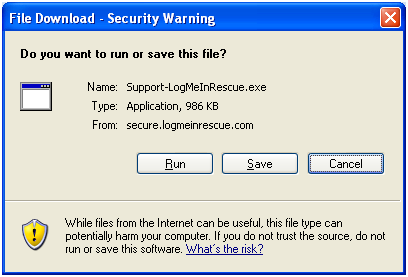 A small applet will be saved as an executable named “Support-LogMeInRescue.exe”. 2. 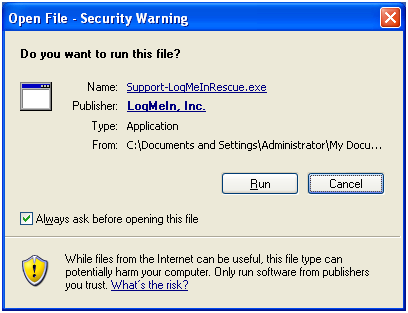 After completing the download, left-click on the button named “Support-LogMeInRescue.exe”. 3. Select “Run” to execute the applet. 4. Once the applet is running, wait for the technician to activate your session. Opera has a similar window that closely resemble to Internet Explorer. 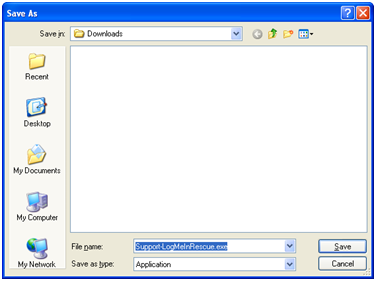 1.Select “Save” to start downloading the applet. 3. A new tab will appear named “Downloads”. Left-click on it. 4. 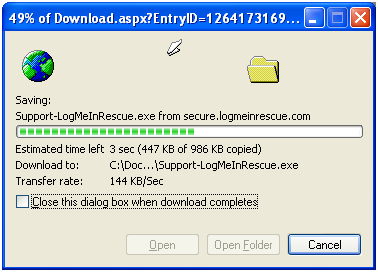 Once the file transfer is completed a green check icon will appear on the left side of “Support-LogMeInRescue.exe”. 5. Right-Click on it then Select “Open”. 6. Once the applet is running, wait for the technician to activate your session. With this suite of backup, security and support services, you'll rest easy knowing that you can effortlessly control, protect and connect to all of your digital stuff.